This month’s Project Marriage challenge was perfect for Mark and I because we had an easy excuse for a date night: our wedding anniversary. We got married on July 18, 1998, 13 years ago (we’ve been together a total of 17 years). We became parents almost exactly 2 years later when our daughter Camryn was born on July 11, 2000. In the 11 years since becoming parents we have never, I repeat NEVER spent a day or night without a child. Although I did plan on asking a friend to babysit, I didn’t think this anniversary would be any different. I thought we’d get childcare just so we could go out to dinner. I didn’t expect the offer of a sleepover. And when the offer came, I didn’t think our son AJ would want to. AJ is 5 ½ now, definitely old enough, but he’s still a big chicken about staying overnight with a friend. The difference here, was that his big sister would also be there. So when I asked, he was super excited. Mark got off work on Sunday at 2:00, came home, grabbed the kids and took them to our friends John & Carin’s house. Once he got back home and showered, we headed out to eat. We had ideas about going to one of the nicer restaurants in our area, but let’s face it, Mark and I just aren’t the fancy types. Maybe we were tried to be at one time, but we just aren’t. Don’t get me wrong, we enjoy really good food, but I guess we’re too boring practical after 13 years of marriage and 11 years of parenthood. So we went to Outback. Mark ordered prime rib, I ordered grilled shrimp and scallops and we shared a little with each other. Romantic, right? My veggies included these awesome little mushrooms that Mark wished he could have an entire bowl of. It was all delicious. Part of this date night challenge included NOT TALKING ABOUT THE KIDS. A really tall order! But guess what, we totally didn’t talk about them. I regaled Mark with all of my blogging/#tweeting/networking/new friend making craziness. 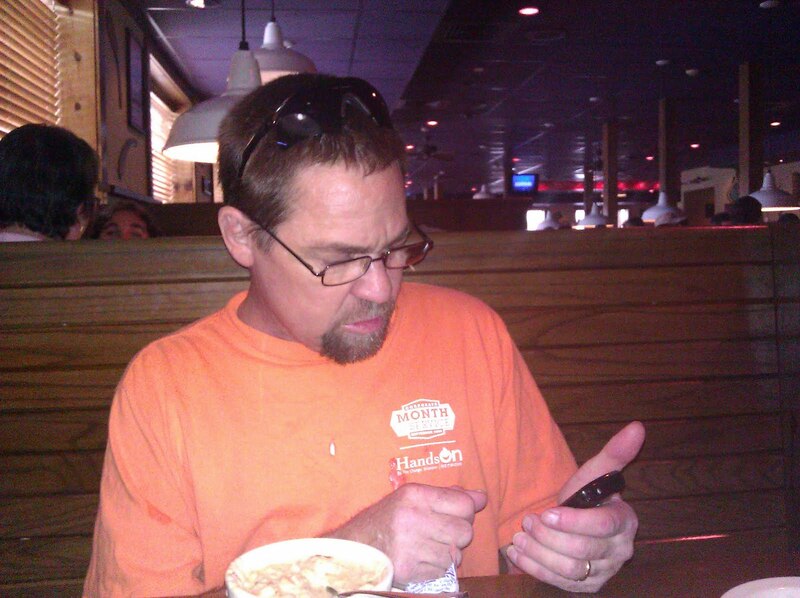 He downloaded an app on this phone to check movie listings to see if there was anything we’d both like to see. Sunglasses on his head and reading glasses on his face is hot, right? Transformers 3 was the only one we’d both like to see, but decided it wasn’t a very date night appropriate movie. Yes, I enjoy the Transformers movies and Shia LaBeouf. Remember that practicality I mentioned before? I suggested since we were close to a Bed, Bath and Beyond that we should stop in and see if they had any butter dishes we would like. Mark agreed. We have very specific features we want in a butter dish. We tried. But at 6:30 on a Sunday night they were already closed. Mark really wanted coffee from Starbucks. OK! Don’t have to twist my arm. Coffee made me think of my teeth. What? Coffee and teeth don’t get along. So my next thought was that I really need a new toothbrush and toothpaste (so did the kids). There’s this shopping area near where we live that has a Target and a Starbucks (actually, there‘s a Starbucks IN Target). So that’s where we headed to next. Perfectly logical right? At Target I grabbed a new light blue t-shirt, a toothbrush and toothpaste for both me and the kids. Mark grabbed a hose sprayer and a new travel cup (because I lost his last one while selling Girl Scout cookies in the freezing cold). Married for 13 years and all I get is a t-shirt. Haha! We ultimately decided not to get Starbucks at Target in favor of a nicer one down the street where we could sit in comfy chairs and chat. Remember how I said it was Sunday night? We got to Starbucks 5 minutes before closing. No bother. We ordered our drinks and took them home. I’ve had "Wall Street: Money Never Sleeps" from Netflix for a couple weeks now, waiting for a night when both of us could watch it. Date Night! We sat down with our Starbucks and turned it on. Well, a little ways into it Mark felt his blood sugar rising. Upon investigation he discovered that his insulin pump connection was DISconnected. Joy. Pause. He got himself hooked back up and we pushed play. While I enjoyed the movie (got some Shia LaBeouf after all), Mark thought it lacking. He remembered that the first one was a bit more of a nail-biter. I said I don’t think every movie has to be exciting to be good. Sorry. You’re not reading this for a movie review. Moving on…. There’s not much more to tell. Next came a glass of wine and back scratching. Wine for me, scratching for Mark. The man LOVES having his back scratched! It’s apparently one of the things he loves most about me, and it’s something I’ve done less and less since our kids were born. We did this while watching Top Gear on BBC America. What? That show is cool. And then it was time for bed. I’m not telling you about that. So that was our date night. Impressive hu? It may not have been the most romantic date, but it was all about us, and that’s all that matters. I enjoyed every minute of it. I told Mark that I love how we simply enjoy each other’s company and genuinely LIKE each other. Mark is my very best friend, my love, my husband, the father of my children and just a great guy. Our life isn’t perfect, whatever that means. But we love each other and we’re happily married. Thanks so much to Life Without Pink for urging us old married types to celebrate marriage! PS: 7/22/11 - I am linking this post up with Bees With Honey for "Let's BEE Friends" as my favorite post of this week. So welcome to anyone who comes over from BWH! You know what matters? You got out, you spent time in each other's company. That's what's important! I'm with Rach- time together = perfection! I think your date night was fun! What matters is that you both enjoyed being together and you went all night without talking about the kids. That's a tough one! Make this happen more and more. It made me sad you haven't done this in so long. I know it is tough, I remember. I am glad you had a night for just the two of you. It didn't have to have fancy places or dress. Just you two...perfect celebration. And the kids? Did they have fun too? I can totally relate to your post. It's so important to go out with your spouse and put your kids on the back burner occassionally. We don't do it often enough because my hubby works two jobs. It's nice that the two of you were able to spend time together. My hubs and I often have the best plans to spend time together but it generally ends up going south. But the times that we do get to have one on one time is great. My husband and I have been married for 14 years and been parents for 13 so, I know where you are coming from.